Until 2017 Frilsham village was visited by the mobile library service. A combination of West Berkshire Council cutbacks and limited use means that the mobile library no longer comes in to the centre of Frilsham. However it visits Harriet House School on the edge of Frilsham on a 3 week rota - see the calendar on the home page for forthcoming dates. This visit is open to anyone who wants to use the service - it is not restricted to the school. If you are unable to get to the library you may wish to use the "At Home Library Service". Volunteers will deliver books to you at home. You will get to know the volunteers well so they will get to understand what you enjoy reading. Or you may like them to choose for you and surprise you on each visit! 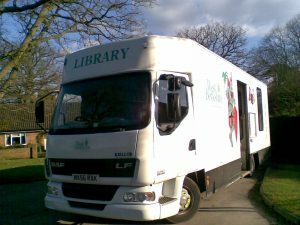 If you want to know more about the mobile library service or the At Home service please call 01635 519827. If you would like to become a volunteer for this service please call the same number.